"Cyber-shot"G (DSC-G3) is a new model in the series of Sony's digital camera brand "Cyber-shot" which first went on sale in 1996. 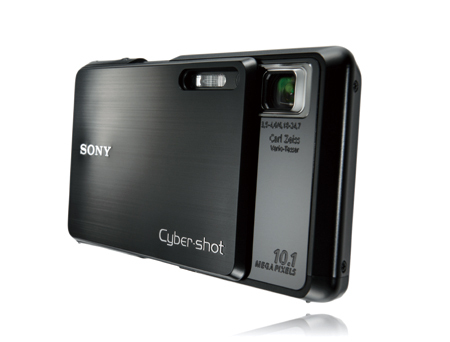 After long years of selling, this product has entirely different functions from the former variation-rich "Cyber-shot" series. Cyber-shot G has a full browser (features that are built into mobile phones and PHS terminals in order to browse websites for personal computers) and a wireless LAN (Wi-Fi authenticated standard) communication function. In a place with wireless LAN, it allows users to access internet, use various web services, and freely upload high quality pictures. These functions can be accessed by an extra-fine LCD screen (3.5 inches, approx. 921,000 dots) touch panel, but the controls are not complicated and the interface is easy to understand. It can be said that the "Cyber-shot" G, with a compact, lightweight, simple, and high-quality appearance, is an innovative product that is expected to be used as a network communication tool, going above and beyond the frameworks of conventional digital cameras.